We’d love your help. 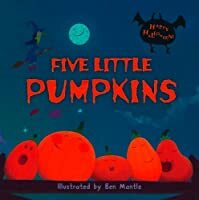 Let us know what’s wrong with this preview of Five Little Pumpkins by Ben Mantle. Count with the pumpkins from one to five as they each experience the fun and spookiness of Halloween night! Spot-laminated pumpkins shine on the cover of this spirited padded board book. To ask other readers questions about Five Little Pumpkins, please sign up. Make some Halloween memories with this book that will last through the years. 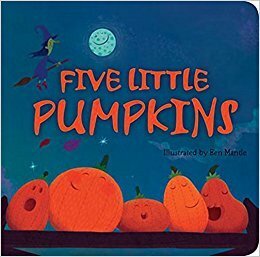 I actually read another story about "Five Little Pumpkins", I liked this one better. The illustrations were better and the story seemed more fun. SUMMARY: Five little pumpkins sitting on a gate.The first one said, "Oh my, it's getting late. "Get ready for some wicked fun as these five pumpkins run and roll! Toddlers will want to chant along with this popular rhyme again and again. Dan Yaccarino's vibrant and bold illustrations bring these pumpkins to life with personality and style. Toddlers are sure to laugh out loud as these pumpkins roll out of sight! REVIEW: According to my 2 1/2 year old grandson, "Gigi this good book!" The rhyming pa SUMMARY: Five little pumpkins sitting on a gate.The first one said, "Oh my, it's getting late. "Get ready for some wicked fun as these five pumpkins run and roll! Toddlers will want to chant along with this popular rhyme again and again. Dan Yaccarino's vibrant and bold illustrations bring these pumpkins to life with personality and style. Toddlers are sure to laugh out loud as these pumpkins roll out of sight! I actually picked this book up on clearance and was able to create a hand puppet to go along with the story! I used a glove, some orange pipe cleaners for the pumpkins and velcro to hold them on. Then I read the story and as each pumpkin left the story I had a student pull one of the pumpkins off the glove! This is a cute rhyme, but it's a classic so the text is not what will make or break this book as there are other versions. What is great about this version are the illustrations. The pumpkins really pop against the dark blue background. The illustrations are a bit spooky but the pumpkins are so fun and friendly looking that it's not too scary for little ones. Charming board book with rhyming verses. Vivid saturated colors against a "spooky" Halloween night. Not too scary for the little ones but does include a little darkness & drama to set it apart from other toddler Halloween books. We liked this one so much that we bought a copy for our two year old's book collection. This book is very beginner level. I would use it in a kindergarten class during halloween but could also be used any time for beginning counting. I think it could be used as read alone practice for kindergartners. This very cute rhyming book will teach your little ones a new way to count to five. It's a spooky fun treat for the kids and very colorful and whimsical for Halloween. This is a great story to read after you've carved the pumpkins and it's time for bed. This is one of my kids' favorites! My son loves trying to figure out which pumpkin is talking and likes to finish each page from memory. Classic fingerplay in a book with fun and friendly illustrations by Ben Mantle. Cute illustrations and Halloween story, but it was difficult to read the words because the pages were so dark. Good board book for toddlers. Fun little rhyme with nice art and some counting. Counting book about pumpkins. Alludes to Halloween but doesn't specifically mention it. A very cute story for little children. And a perfect Halloween bed time story. Story and images are adorable, but the contrast of the font against the illustrations are impossible to read if it isn't bright out. Summary: This book is about the song Five Little Pumpkins. It is a spin off of the five little monkeys but a halloween twist. Each pumpkin has something to say before rolling away. Review: This is a cute song and easy for the children to remember. It's a song I remember learning when I was younger. I have also seen this is multiple observation classrooms. The first one said, "My, it's getting late!" The second one said, "There are witches in the air!" The third one said, "Good folk, beware!" The fourth one said, "We'll run and run!" The fifth one said, "Let's have some fun!" "Woooooo!" went the wind . . .
And OUT went the light . 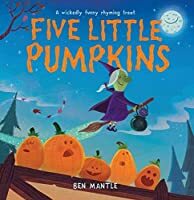 . .
Ben Mantle illustrates the traditional Halloween fingerplay "Five Little Pumpkins." The pictures are done in soft colors with cozy exp Five little pumpkins sitting on a gate. Ben Mantle illustrates the traditional Halloween fingerplay "Five Little Pumpkins." The pictures are done in soft colors with cozy expressions on all the characters' faces including a grandmotherly witch and a polka dot moon. Despite an overly simple rhyme, the rhyme itself coupled with vivid illustrations make this a great seasonal read for very young readers. So far this is my favorite version of Five Little Pumpkins. I loved the board book with the lovely illustrations. So cute and fun. We like to count the pumpkins, ghosts, and spiders.